Hey Highroller - Kick Off! Are you one of those people who loves riding the trolleys at the airport? (until you're told off...) If so, this is the product for you! 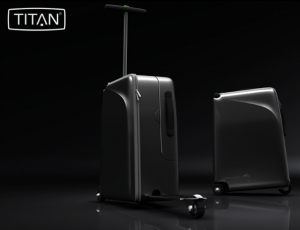 Titan Luggage has introduced the Highroller Suitcase - a combination scooter and suitcase, putting a bit of pep into your roll between terminals. Introducing suitcase-blading: via a suitcase that turns into a kick-bike. 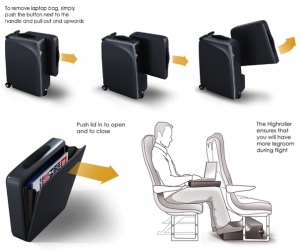 This product turns a long terminal walk with a heavy suitcase into a zippy ride. Imagine airports full of business men scootering around - would it not make the traveling experience more joyful? Security needs something to laugh at. The Highroller also includes a detachable laptop bag and kicks under the seat of trains in its slimmer form, allowing for sleek arrivals and departures. Lock and roll!